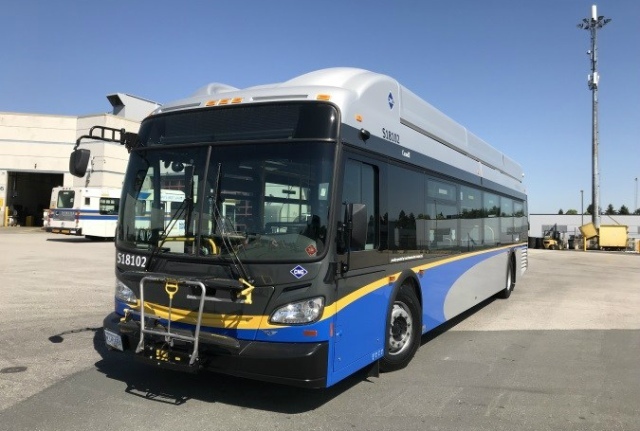 TransLink announced that the first of 106 new CNG buses have arrived and began serving customers on Surrey (British Columbia) streets, with full roll out of the new buses by the end of the year. Once all the new buses are in service, it will mean more than half the 209 buses in the Surrey fleet will be new, providing a better customer experience. TransLink currently has 146 CNG buses in its fleet, operating out of the Port Coquitlam Transit Centre and the Hamilton Transit Centre in Richmond. With the addition of these new buses, more than half of TransLink’s conventional bus fleet will run using clean energy, including 252 natural gas vehicles. The total cost of the CNG bus purchase, along with upgrades to the Surrey Transit Centre that includes a new fueling facility and other works to accommodate the new buses, is approximately $86 million. Of this, about 80% of the total comes from the federal gas tax, allocated by the Metro Vancouver board of directors. The remainder is funded by TransLink. Also, the cost of purchasing the new CNG buses is offset by contributions from FortisBC through its Natural Gas for Transportation vehicle incentive program. “These new buses represent a major renewal for our Surrey transit fleet, and the benefits are many. Our customers and bus operators will enjoy a more comfortable ride with air-conditioned, quieter buses. And these new buses will also deliver substantial financial and environmental benefits with significantly reduced fuel costs and reduced greenhouse gas emissions,” said Kevin Desmond, CEO, TransLink.